Aylesbury Villa is a private family owned vacation home, it has four bedrooms and three bathrooms and can comfortably accommodate eight people plus an infant. It is ideal for families with two master bedrooms, two twin bedded rooms and the games rooms to occupy guests of all ages. It has its own large swimming pool, is fully air conditioned (that you can control), is tastefully furnished throughout and well maintained. It is a home from home and a lovely place to relax after a busy day enjoying all the exciting places Orlando has to offer. The open plan living area, incorporating the lounge, kitchen and dining areas, has a vaulted ceiling gives it a bright and airy feel. The lounge is tastefully furnished with large sofas and has a Flat screen TV with full Cable package, DVD with surround sound and a Docking Station (for iPhone and iPod use) with a CD player and radio. There are a selection of DVDs and CDs for your use. On the days you choose not to dine out our kitchen is fully equipped with everything you require. The laundry area has a full size Washing Machine, Tumble Dryer, Iron and Ironing board. The adjacent dining area seats six people with additional seating for up to eight and overlooks the pool. The Master Bedroom is situated at the rear of the property, it is a large room with a King size bed, walk in wardrobe, a Flat screen cable TV and sliding doors onto the pool deck. The Guest Master Bedroom is situated at the front of the property, it is a lovely bright room with a large bay window a Queen size bed, closet and a Flat screen cable TV. There are two twin bedded rooms, one has a Mickey Mouse theme, a Xbox 360 and games. Both rooms have a wardrobe closet and Cable TV. The family bathroom is shared by the twin bedded rooms. The garage has been converted into a Games Room and has a full size Pool Table, Football Table, a magnetic Darts Board and table and chairs as well as a selection of family/childrens games, toys and books for all the family. A sliding door leads from the lounge onto our extended pool deck which has a large lanai giving shade from the hot Florida sun; it is furnished with a table and chairs for outside dining and sun loungers. 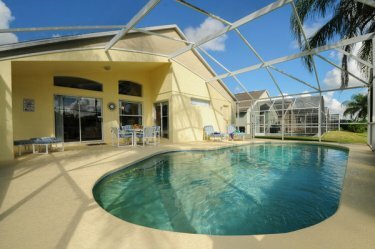 The large screened pool (15' x 30') has mosaic dolphins on the bottom, it is south east facing so you can enjoy the sun from early morning until late afternoon. It can be heated for an additional charge, usually required from November to April. The Villa is maintained to a high standard by our locally based Management Company who also provide a 24 hour emergency helpline. It will be cleaned before and after your stay. We provide free of charge, internet connection, US telephone calls, a safe, all linen, towels including pool and beach towels, a High Chair, Cot with bedding, a Stroller/Pushchair and a welcome pack of basic groceries on your arrival. The villa is fitted with a monitored alarm system and smoke alarms. Our home is strictly NO pets and NO smoking. 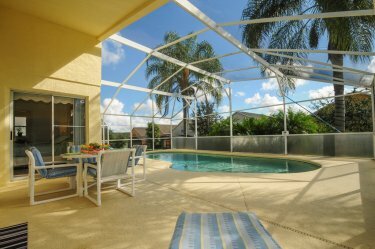 Our Villa is located in a quiet location off the US27 just five minutes from exit 55 of the main Interstate (I4) which will take you directly into Orlando for the Disney and Universal attractions as well as the lovely beaches of the Gulf and Atlantic coasts. It is well situated for your holiday, close by there are several executive golf courses, restaurants, shops, takeaways and supermarkets, including a large WAL MART and Publix. The shopping development, Posner Park is less than a mile away offering, Target, JC Pennys, Best Buy, Dicks Sporting Goods, restaurants and a Cinema . The lively Highway 192 is 15 minutes drive, here you can find many of the popular Bars, Restaurants like TGI Friday�s, Outback, Olive Garden, Carabbas plus shopping outlets and more family entertainment.